Good morning, friends! It is finally, officially, the Christmas season! My husband insisted that we wait until December proper to start decorating, so I’m not exactly surrounded by holiday spirit, yet, but we’ll get there. This week I have plans to put up the tree and pull out the wreath and maybe even put batteries in it this year. We’ll see! Our fridge is properly stocked with peppermint chocolate milk, because my husband is just a little bit into it. And by a little bit, I mean it’s his favorite thing right now. I have yet to decide what I’m doing this Christmas. I’ve been doing memories, which were fun, but kind of a finite resource. I’ve only got twenty-six years to look back on and not all of them were notable. Last year I focused more on the new traditions we were forming and how we were merging our family traditions together to form our own family Christmas routine. The thing about that, is, again, kind of finite. Sure, we’ll probably do some new things, but mostly it’ll be the established things from last year. Next year will be decidedly more interesting as we figure out how we’re doing Christmas with the boys and what childhood traditions we want to share with them. This year, they are just focusing on growing and have no time for Christmas festivities. That being said, this year will probably be mostly the saga of a pregnant holiday season. Are you sick of hearing about how I’m pregnant yet? Sorry about that. You can come back in the spring, if you like, and it’ll be all babies, all the time… when I have time. Not so sure I’ll be blogging very much for the first half of the year. I also may switch to an evening schedule so I can write while Logan takes the boys for a bit. Of course I’ll more likely take a nap while Logan takes the boys. Anyway, I imagine you’ll be hearing a lot about my experiences navigating Christmas traditions while growing two humans inside me. 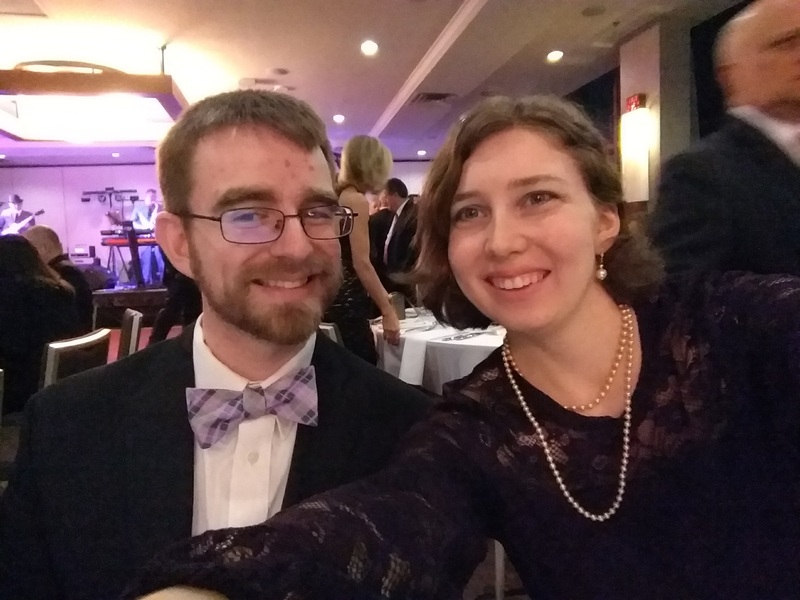 To start us off, we kicked off our Christmas season with the usual Black Friday shopping and, unusually, with my husband’s work Christmas party. Both went about as well as I expected. I actually managed to find some gifts and everything while shopping, which is always hit or miss. Sometimes I just buy things for the house, or things that Logan needs but is reluctant to buy for himself. I almost always buy something for myself, because when things are on sale, I don’t feel so bad about buying new fuzzy socks and a cute top. This year I bought mostly maternity clothes, which was a little rough. Apparently the places around us just have really bad maternity sections. They are tiny, or non-existent and tough to find. I did manage to get two actual maternity tops and a pair of leggings, though, along with a new sweater and a dress for the Christmas party. Yes, the Christmas party. The dreaded formal event of the season. Logan is not into formal events, or big social events, for that matter. This year was anticipated to be especially awkward as his department is now a whole separate company. Most of the rest of the company has yet to accept that fact. So we weren’t entirely sure what to expect going in, but, luckily, we also have a built in diversion. Every conversation we had with people outside Logan’s actual company basically went “How’s it going? Congratulations! How do you feel? You look great!” with the appropriate polite responses thrown in. Sometimes we’d get a “That’s exciting, are you excited?” No, why would we be excited to be having twins? We did have some very nice conversations expounding on that with the wives of the president and vice president. They are very nice ladies, and I like them. Apparently there is a lot of excitement about our boys buzzing around. We skipped out on most of the cocktail hour, because, you know, pregnant. It turned out to be a really good thing we did, as the two couples from the gang who went to the cocktail hour ended up sick after the party and the two that did not, were fine. If I had forgotten that the Lord is looking out for me and the boys, this was a great reminder. Food poisoning can be really bad while pregnant. Other than that, the food was very good, as usual, and it was nice to see everyone and get all dressed up. Hopefully this week we’ll get the tree up and it’ll start to feel a little more Christmasy around here. First, of course, I have to tidy up the living room so I can run the vacuum before and after we set up the tree. I am very excited to get the tree out and set up and everything. I might consider doing it on my own if I could lift the tree by myself, but that’s very not a thing right now. And besides, it’s much more fun to do it with someone else. I will make my husband listen to Christmas music while we do the tree, but I’ll try to pick something good at least. I hope all of you are enjoying the beginning of this Christmas season. Have a lovely day, my friends!